The Air Power Soccer Disk is an amazing new disk that turns nearly any smooth surface into a sports court, inside or out! Use it on a low-pile carpet, hardwood floor, sidewalk or a driveway! As long as you have a flat surface, there’s no end to the ways you can play! It has a powerful hover action that makes the Air Power Soccer Disk literally float on a cushion of air! The disk’s outer rim’s protective bumper safely protects furniture and walls while allowing for great rebounding! 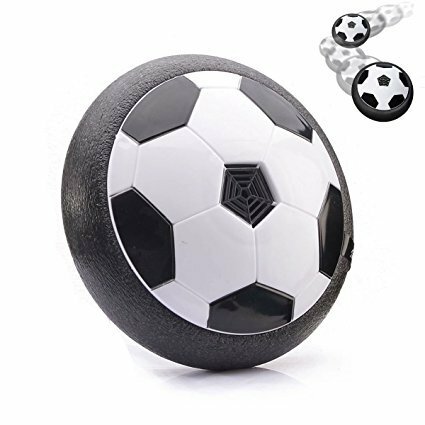 Flip the power switch, put it on a smooth surface and give it a little kick!You can kick it like a real soccer ball, smack it with a real hockey stick or send it sailing like a bowling ball crashing into your “bowling pins” of plastic bottles or cups! Powered by 4 “AA” batteries (NOT INCLUDED), this Air Power Soccer Hover Disk glides on a cushion of air! A creative new way to play soccer and air hockey all in one game! Can You Imagine a playful disk that actually hovers on a cushion of air? We did. Presenting the Air Power Soccer Disk, the amazing new disk that turns nearly any smooth surface into a sport court, indoors OR outdoors. Use it on low-pile carpeting, wood floors, sidewalks and driveways - there’s just no end to the ways you can play. smooth surface into a sport court, indoors OR outdoors. Use it on low-pile carpeting, wood floors, sidewalks and driveways - there’s just no end to the ways you can play. With its powerful hover action, the Air Power Soccer Disc literally floats on a cushion of air. The disk’s outer rim safely protects furniture and walls while allowing great rebounding. Just switch it on, place it onto any smooth surface, and a simple kick propels the disc for fast sports action indoors or out. - Kick It. Enjoy an exciting game of Air Soccer any time, anywhere. OTHER USES - Stick It. Using a regular hockey stick, you can play full scale Air Hockey. - Bowl It. With the Air Power Soccer Disc and a few empty plastic bottles, you can convert your hallway into a bowling Alley.